It seems like only yesterday the Orlando Psycho City Derby Girls were making the rounds at various Central Florida locations to recruit the newest class of Lunachicks. Lunachicks are Orlando's fresh meat that go through a 3 month recruitment program that teaches all the skills to meet the minimum skills required for skaters in leagues under the Women's Flat Track Derby Association (WFTDA) rules set. Requirements to become a full-fledged league member include early Sunday morning practices, lending a hand at all OPCDG bouts, attending OPCDG affiliated events, and taking a two-part test. After the information night, Lunas, as the league calls them, enter a three-month period of learning all of the skills to prepare them to move into Psych Warden status. Once in Psych Warden status, these ladies are integrated into the scrimmaging phase of roller derby. 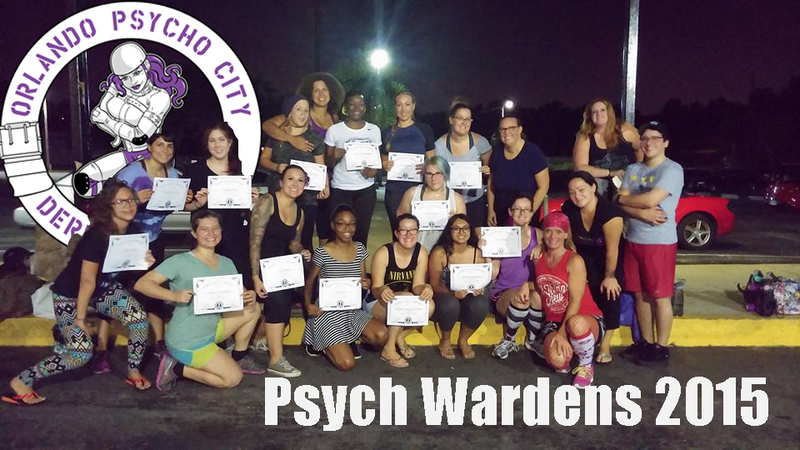 With over 30 new recruits starting the recruitment phase, our league saw the highest number of new recruits move into Psych Wardens. Twenty Lunas graduated to the next stage in their roller derby careers on Wednesday September 2nd, 2015. These ladies will begin practicing their scrimmage skills in small groups and eventually rotate amongst the three Orlando Psycho City Derby Girls home teams. The Psycho Sisters proudly congratulate every new Psych Warden and are excited to see what the future holds for these fierce contenders! So, you decided you want to be a derby warrior: CONGRATS! You’ve just made one of the best decisions of your life. Before you head over to an internet name generator (BOOOOORING! ), remember that roller derby is an experience that changes your life forever. While you may have your name picked out before you start your first practice, think of your derby name as a tattoo. It’s going to stick around for a long time and changing it may not be as easy as it seems (you’re putting this moniker on legal documents, scrimmage shirts, helmets, jerseys, etcetera). During the three months of recruitment, our Psych Wardens kept their lips sealed on what they would want to be called after testing. Their names were revealed when they moved into Psych Warden status. This class of Psych Wardens did not disappoint with their tributes to home states, literary characters, and entertainment industry personas. For more tips about choosing a derby name, check out SVRG’s Ultimate Guide to Choosing Your Derby Name. Lunachicks gear up for their first night of recruitment. Curious about what it takes to be a roller derby hero? Throw those excuses out and join us at one of our recruitment information sessions to pique your interest. Our recruitment coach, Awol, has an incredibly effective and well-laid out plan to prepare you for Psych Warden status. Lunachicks move into Psych Warden status. It seems like only yesterday the Orlando Psycho City Derby Girls were making the rounds at various Central Florida locations to recruit the newest class of Lunachicks. Lunachicks are Orlando’s fresh meat that go through a 3 month recruitment program that teaches all the skills to meet the minimum skills required for skaters in leagues under the Women’s Flat Track Derby Association (WFTDA) rules set.